The Eid Prayer is wajib (obligatory) according to the majority of scholars. The Prophet (peace be upon him) performed it consistently and commanded all the people to go out for it. Let the free women, the virgins, and the menstruating women go out to attend the Eid prayer, and witness the good and the supplications of the believers. As for the menstruating women, they should stay away from the musalla. (i.e., should not participate in the prayer itself). "... Thus we lean towards the opinion that Salatul-Eid is fard `Ayn (individual obligation) on each individual. This is the opinion of Abu Hanifah and others, and is one of the two reported opinions of ash-Shafi`i and of the school of Ahmad. The opinion held by some people, that it is not wajib, it is extremely unlikely, because it is one of the greatest rites of Islam; more people gather for it than for Friday; and the Takbir has been legislated for its sake. The opinion of those who say that it is fard kifayah (communal obligation) is unjustified..."
"Note that the Prophet (peace be upon him) consistently performed this prayer on every Eid, never neglecting it. He commanded the people to go out for it; he even commanded the free women, the virgins, and the menstruating women to go out, instructing the latter to refrain from praying, in order for all of them to witness this good and the Muslims' supplications. He (peace be upon him) further commanded the woman who did not own a jilbab (outer overall garment for women) to borrow her friend's. All of this proves that this prayer is wajib on every individual, not only a kifayah obligation. Commanding the people to go out for it entails the command to perform the prayer (for those who have no excuse). This is the content of his (peace be upon him) address, because going out is a means for performing the prayer (an end); if the means is obligatory, then the end is. And this obligation applies to men even more so that women. Further evidence is that it overrides the Friday prayer when both occur on the same day. That which is not wajib cannot override that which is. Furthermore, it is confirmed that the Prophet (peace be upon him) performed it consistently in Jama`ah (congregation) from the time that it was legislated until he died. To this is added his command to people to go out for it." "The Prophet's (peace be upon him) command mentioned here indicates obligation; when it is wajib to go out for it, it is wajib to pray it, because of its higher priority. Thus the truth is that it is an obligation - not a mere recommendation." "The Prophet (peace be upon him) went out (of his house) on the day of Fitr, prayed two Rak`at, and did not pray before or after it." "Neither he (peace be upon him) nor his companions prayed when they arrived at the musalla - before the prayer or after it." "... In short, there is no confirmed sunnah prayer before or after the Eid prayer - contrary to those who compare it to the Jumu`ah prayer." "The Prophet (peace be upon him) would not pray at all before the Eid prayer; but when he returned to his house, he prayed." "So the negation of praying before and after the Eid prayer refers only to praying at the musalla." "We (at the time of the Prophet (peace be upon him)) used to be finished with the prayer by now." "The Prophet (peace be upon him) delayed the prayer of Eidul-Fitr, and was prompt with that of al-Adha. And Ibn `Umar, despite his extreme adherence to the Sunnah, would not go out until the sun had risen." "The time of the two Eid prayers is after the sun has reached the height of a spear, and until noon. The consensus of the scholars about this is in agreement with the (related) Hadiths - despite their weakness." "The time of the two Eid's prayers is after the sun has reached the height of a spear, and until noon. However, it is best to pray al-Adha at the earliest time, to enable the people to slaughter their sacrifices; and is recommended to delay al-Fitr prayer, to enable the people to give out their Sadaqah (zakatul-Fitr)." "The crescent of Shawwal was obscure to us. So we continued to fast that morning; later in the day, a group of travelers arrived and testified before Allah's Messenger (peace be upon him) that they had seen the hilal (crescent) the previous day; so he (peace be upon him) commanded the people to break their fast on that day, and to go out to the musalla the following morning." "I prayed the Eid prayer with Allah's Messenger (peace be upon him), on more than one occasion, without Athan or Iqamah." "Athan was never given (for the Eid prayer) on the day of Fitr, nor the day of Adha." "He (peace be upon him) would arrive at the musalla and start the prayer without Athan, Iqamah, or announcing, 'Congregate for prayer'. The Sunnah is not to do any of that." "This provides evidence that it is not permissible to do that (announcing) for the Eid prayer. So, doing it is a bid`ah (innovation)." "The travelers' prayer is two Rak`at; the Adha prayer is two Rak`at; the Fitr prayer is two Rak`at; and the Jumu`ah prayer is two Rak`at; this is their full length as came upon the tongue of Muhammad (peace be upon him)." Like any other deed in Islam, the prayer must be preceded with the true intention. The intention should be present in the heart before starting the prayer. Like any other prayer, the first rak`ah (one prayer unit) must be started with Takbirul-ihram; this is followed by the opening supplication. "Allah's Messenger (peace be upon him) would say Takbir in both Fitr and Adha: seven in the first, and five in the second - other than the two Takbirs of ruku` (bowing)." "This is the opinion of most of the people of knowledge among the Companions and those after them: to say, before reciting Quran, in the first rak`ah of the Eid prayer, seven Takbirs other than the opening Takbir, and in the second, five Takbirs other than the Takbir of rising. This has been reported from Abu Bakr, `Umar, `Alee, and others." "In the Eid prayer, Allah's Messenger (peace be upon him) said seven Takbirs in the first rak`ah, recited (Quran), said the Takbir and bowed, prostrated himself; then he stood, said five Takbirs, recited, said Takbir, bowed, and prostrated." Ibnul-Qayyim commented that anything contrary to this is not true. "The reports from `Umar and his son do not make this a sunnah. Especially when we know that these reports are not authentic. As for the one from `Umar, it is recorded by al-Bayhaqi with a weak chain. As for his son's, I have not been able to locate it now." "Ibn `Umar, who is known to adhere closely to the Sunnah, used to raise his hands with every one of the Takbirs." "One may raise his hands if he believes that Ibn `Umar would not do this without an approval from the Prophet (peace be upon him)." There are no authentic reports indicating that the people would raise their voice with Takbir when praying behind the imam. The Sunnah is to say all dhikr secretly, except in specific cases where the contrary was confirmed. This is enforced further in situations where raising the voice would disturb other people's prayer. Therefore, it is not permissible for anyone other than the imam to raise the voice with Takbir in the prayer. "Between every two Takbirs is a praise of Allah and a salah upon the Prophet (peace be upon him)." "The Prophet (peace be upon him) used to remain silent between every two Takbirs, and nothing is reported from him regarding dhikr between them." The Takbir is a sunnah (recommended act). Leaving it, whether intentionally or forgetfully, does not invalidate the prayer. There is no difference of opinion on this among the scholars. However, there is no doubt that anyone who neglects it intentionally would be violating the sunnah of the Prophet (peace be upon him). After the Takbirs, one should utter ta`awwuth and basmalah. This is followed by reciting al-Fatihah, which is a required pillar in every rak`ah of every prayer. This is followed by reciting Surat Qaaf (50) in the first rak`ah, and Sooratul-Qamar (54) in the second. Alternatively, one may recite: Suratul-A`laa (87) in the first, and Sooratul-Ghashiyah (88) in the second. "Both of these have been authentically reported from the action of the Prophet (peace be upon him). Nothing else is authentic." There is surely wisdom in reciting these particular surahs in Eid. Some of this has been discussed by scholars like an-Nawawi and ash-Shawkani. The remainder of the Eid prayer is performed in the same manner as any other prayer, without any difference. "When one misses the Eid prayer, he prays two Rak`at." The permission to make up the Eid prayer for the one who misses praying it with the Jama`ah - whether that happened by compulsion or choice. That it is made-up as two Rak`at." "This is the opinion of ash-Shafi`i - that if one misses the prayer with the imam, he should pray two Rak`at in order to at least attain the virtue of performing the Eid prayer, despite the fact that he missed the virtue of praying it in Jama`ah with the imam. As for the Hanafis, there is no make-up for the Eid prayer. If one misses it with the imam, he has totally missed it." "In my opinion, anyone who prays the Eid prayer individually, whether man or woman, should say seven Takbirs in the first rak`ah, before recitation, and five in the second, before recitation." "The one who comes late to the Eid prayer should perform what he missed according to the way that he missed it. This is true for any prayer." "I attended the Eid with Allah's Messenger (peace be upon him), Abu Bakr, `Umar, and `Uthman (may Allah be please with him); all of them would pray before the khutbah." "The Prophet (peace be upon him), Abu Bakr, and `Umar prayed the Eid (prayers) before the khutbah." "He means that this (performing the prayer before the khutbah) was the sunnah of Allah's Messenger (peace be upon him), and the practice of the Righteous Khulafa' (Successors, may Allah be please with him) after him. The change that came later (switching the khutbah and the prayer) is an innovation done by Marwan." "On the day of al-Fitr and al-Adha, the Prophet (peace be upon him) used to go out (from his house) to the musalla, and the first thing that he did was perform the prayer. Then he turned around and stood facing the people, while they were sitting in their rows. He admonished, advised, and commanded them. After that, if he wished to send an expedition, or give some orders, he would do so; then he would depart. The people followed this tradition until I went out with Marwan, when he was the amir (ruler) of al-Madinah, for the prayer of Eidul-Adha or Eidul-Fitr. When he reached the musalla, I found a minbar (raised steps to address people from), which was built by Kathir Bin as-Salt. Marwan started to mount the minbar before the prayer. I grabbed his shirt, but he yanked it back, ascended the minbar, and delivered the khutbah before the prayer. I said to him, 'By Allah, you have changed (the sunnah).' He replied, 'O Abu Sa'eed, that which you know is gone!' I said, 'By Allah, that which I know is better than that which I do not.' So he explained, 'People would not sit to listen when it was after the prayer, so I made it before it.' "
"This is the acceptable practice among the people of knowledge among the Prophet's (peace be upon him) companions and others: that the Eid prayer should precede the khutbah. It is reported that the first one to offer the khutbah before the prayer was Marwan Bin al-Hakam." Takbir At The Beginning Of The Khutbah? "The Hadith reported from Sa`dul-Qarz that, "The Prophet (peace be upon him) would say Takbir often during his khutbah, and he said it more often during the Eid khutbahs." - is a weak Hadith. Besides, it does not indicate starting the khutbah with Takbir, but only that he used to say it frequently during it." "Allah's Messenger (peace be upon him) used to begin all of his khutbahs with al-hamdu lillah. Not even one authentic Hadith indicates that he started the Eid's khutbah with Takbir." There is no authentic Hadith indicating that the Eid khutbah is to be divided into two parts separated with a sitting (as for Jumu`ah). The only report in this regard is very weak. Thus, the khutbah should be kept as one unit, which is consistent with the original understanding and practice. It is not permissible to bring out a minbar to the musalla or to build a fixed one. This follows from the above mentioned Hadith of Abu Sa'eed (may Allah be please with him) where he said, "... Then he (peace be upon him) turned around and stood facing the people, while they were sitting in their rows. He admonished, advised, and commanded them," which makes it clear that he did not mount a minbar. Also, he (May Allah be please with him) said to Marwan, "By Allah, you have changed (the Sunnah)." His objection here refers to two things: building the minbar, and delivering the khutbah before the prayer. "I witnessed with Allah's Messenger (peace be upon him) the prayer on an Eid day. He started with the prayer, before the khutbah, without Athan or Iqamah. Then he stood, leaning on Bilal, and commanded people to fear Allah..."
This clearly indicates that he was not standing on a minbar during the khutbah. We shall have a khutbah; so let whoever wishes to sit for the khutbah do so, and whoever wishes to leave. "He (peace be upon him) gave choice for those who attended the Eid to either sit for the khutbah or leave." Two Eids have coincided on this day of yours; thus, whoever wishes is exempted from attending the Jumu`ah prayer. Yet, we shall hold it. "I witnessed Mu`awiyah Bin Abi Sufyan asking Zayd Bin Arqam, 'Were you with Allah's Messenger (peace be upon him) when one of the Eids and Friday occurred on the same day?' He said, 'Yes.' He asked, 'What did he do?' He answered, 'He (peace be upon him) performed the Eid prayer, then gave the option concerning Jumu`ah, saying, Let whoever wishes to pray it do so." "Let the one who wishes to come for Jumu`ah do so, and the one who wishes to sit do so." "These are two Eids that have come together on one day. 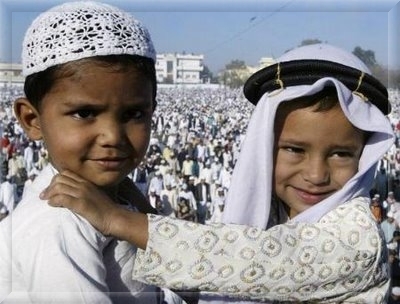 Their coincidence makes them one (Eid)." Then he prayed on that Friday two Rak`at in the morning as Eidul-Fitr prayer, and did not pray anymore until he prayed the `Asr prayer. "The apparent understanding from this is that he did not pray zuhr. And that if the Jumu`ah prayer is cancelled for any acceptable reason, then the one for whom it was cancelled is not required to pray zuhr. This is the opinion of `Ata'..."
That one is still obliged to pray the Jumu`ah - whether or not he prayed the Eid. This is the opinion of Malik and others. That the Jumu`ah becomes optional for the people of the suburbs and villages. This was practiced by `Uthman (may Allah be please with him), and ash-Shafi`i took up this opinion. This is what has been authentically reported from Allah's Messenger (peace be upon him) and his successors and Sahabah (may Allah be please with him), and is the opinion of the later scholars who learned of these reports, such as Imam Ahmad. Those who disagreed with him did not learn about these Hadiths and reports."